Generating Apple Developer Resources yourself. 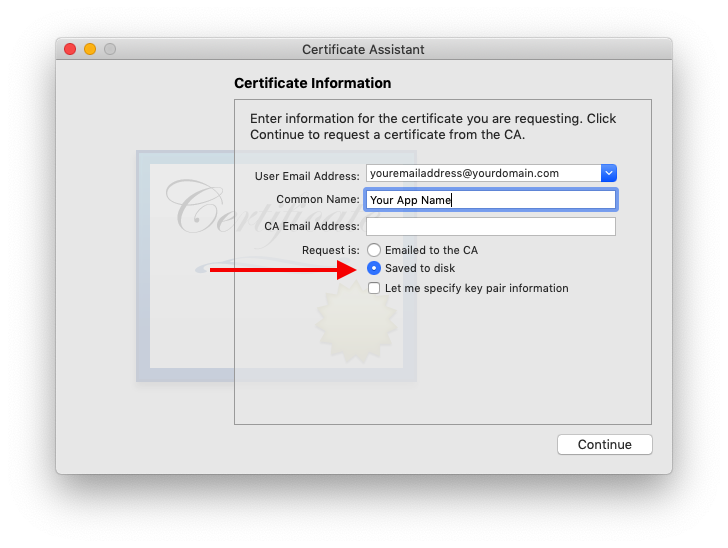 As mentioned in other articles on App Submission, it is possible to generate the App Store Certificate, Provisioning Profile and APNS key and send them to 3D Issue to use during your App Submission. The instructions below provide the steps (as of Feb 2019) for this. The process can change quite often so if you have trouble, we’ll do our best to help. These steps require Access to a MacOS computer. If you app has already been setup or submitted to the App Store you can skip to Step 2. Go to The Apple Developer console App IDs page. Login with your Apple ID if not already logged in. Select Explicit App ID and in Bundle ID, enter the same value as is entered in the Binary details on the 3D Issue apps Dashboard. Check the box beside the following services: Associated Domains, Push Notifications. Click Register on the next page. Then Done. Go to the Apple Developer console Certificates page. Login with your Apple ID if not already. On the next page, scroll down to the Production section and check the box beside App Store and Ad Hoc. For these next Steps you’ll need to be using a Mac. Common Name: Use your company or app name. Do not enter any quotes, commas or other punctuation marks. Click Continue within Keychain Access and save the CSR file to your Desktop. Go back to your browser and upload the CSR to Apple. Click Continue and then download the certificate. When downloaded, click the Certificate file to open it and import it to your login keychain. Open Keychain Access again and in the left column click on login then, near the bottom left, click on Certificates. Then click the small arrow to the left of the cert, to expand it and show its key. Select the both the cert and it’s key and right-click (ctrl-click). In the dialog that opens, change the File Format to Personal Information Exchange (.p12) then save the file to your Desktop. When setting the password, please note that you need to send us that also, so don’t use a password you use somewhere else! Go to the Profiles page on the Apple Developer console. Login if you aren’t already. Select the Certificate you just created. Hint: Its date will be the newest. Then download the Provisioning Profile file. If your app has already been submitted by 3D Issue before, you can ignore this step and skip to step 5. Go to the Keys page on the Apple Developer Console. Login if you are not already. On the next page, give the key a name, such as “3D issue” or your App’s name. On the next page click Confirm. On the following page, Download the key and make a note of the key ID. Put all the files you just created into a Folder and compress it to a zip file. The Key ID for your APNS key.